Centerville Pie Company’s top-seller: chicken pie. Bowen and Broadley — a married couple — have been Cape Cod’s premier pie ladies for nearly a decade. Broadley, a Rhode Island native, attended Johnson & Wales University, while Bowen, a Cape Codder, perfected her skills at a local pastry shop. Both of the women worked at the Hearth ’n Kettle Restaurant on the Cape — Bowen was a chef and manager — but then the pair took wildly different career paths. Bowen served as a Barnstable deputy sheriff for six years and Broadley worked in banking. After being robbed twice at the bank, Broadley had had enough. She quit her job and, with a small inheritance, bought the space that now houses Centerville Pie Co.’s pie shop and restaurant. She enticed Bowen to join her — with the fabulous chicken pie recipe that Bowen had tweaked and baked over the years. The year was 2009, and the economy was in shambles. “People thought I was totally crazy to start a business then,” Broadley recalls. Success seemed like a pie-in-the-sky fantasy. Then along came Oprah. In August of that year, Broadley heard through the grapevine that Winfrey was in town for Eunice Shriver’s funeral, and staying at a local inn. “I brought over a chicken pie and a peach pie to Oprah with a note that said, ‘I love and respect you,’ along with my home phone number,” Broadley recalls. 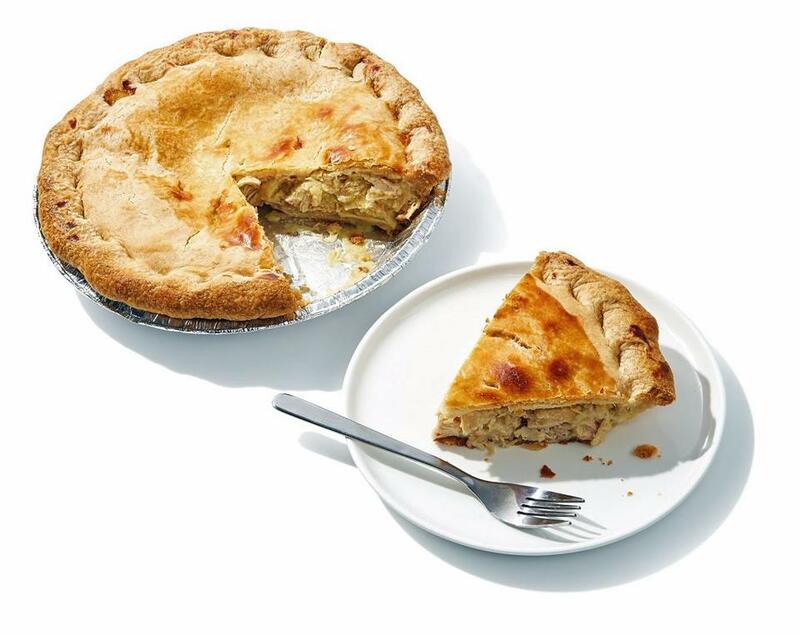 “By the time I drove home, Oprah and [BFF] Gayle King were on the speaker phone with me,” raving about the pies. When Bowen heard the news, “I was jumping up and down,” she says. “Oprah was sizing us up,” Broadley recalls. “I lied and told her we had six employees, because three just didn’t seem like enough,” she says. Later, King asked for some warm pies to take on her flight, and some frozen ones to take home. “We worked right through the night and made 40 pies,” Bowen recalls. The next day, they drove out to the private jet at Hyannis airport to deliver the goods. In 2010, the pair was invited to appear on the Oprah show, during its final season. On the set, they were so shaky with nerves that producers had to glue the pie to the plate so they wouldn’t drop it. They sold 280,000 pies in 15 minutes — a daunting number, considering they were making just 12 pies at a time back on Cape Cod. Hollywood came calling in 2011, when the company was asked to offer swag bags at the Golden Globe Awards. “Other people were handing out $5,000 watches. We were giving out pieces of chicken pie, and a coupon for a free pie!” Broadley recounts. Even skinny celebrities can’t resist pie, it seems. Every single one of those stars redeemed their coupons, she says. Among their most zealous fans that night were Modern Family cast members Eric Stonestreet and Rico Rodriguez and actress Jennifer Love Hewitt. Eric McCormack of Will & Grace initially refused his sample of pie, saying, “No, I make great pie.” Bowen urged him to try a slice anyway. “He came back and said, ‘Your crust is better than mine,’ ” Bowen says. “How are you doing, Sunshine?” Broadley asks a patron in the 16-seat restaurant during the lunchtime rush. Tables sport red-checkered cloths; there’s also a bar that offers a good view of the pies. A slice of coconut cream pie, piled high with whipped cream, looks tempting. Here, the slogan, “Life is short. Eat dessert first,” applies. Entrée-wise, there’s always the signature chicken pie (the number one seller by far) and two or three other savory pies on a rotating basis, among the blackboard specials. Shepherd’s pie takes the number two spot, and French meat pie (Broadley’s personal favorite) is coming on strong. Younger customers go for the Buffalo chicken pie (“Kids like hot,” Broadley notes.) On the sweet side, apple pie is a clear favorite. The Cape Cod Crunch pie — featuring chocolate pudding mixed with butter toffee, topped with whipped cream and bits of toffee — is hugely popular. So what is it about pie that seems resistant to food trends? “It’s the ultimate comfort food,” Broadley says. “People who are going through cancer treatment often can’t taste, but for some reason, they can taste the chicken pie.” Bowen points to the nostalgia factor; many of us remember hanging in the kitchen with a grandparent, helping bake a pie. These days, parents are working and don’t have time to make scratch pastry. But they can stop by the shop for a hot pie to bring home, or pick up a frozen one and bake it in their home oven. “It takes an hour-and-a-half, or two glasses of wine,” Broadley notes. And it sure makes the house smell good. Even if you’re trying to cut down on carbs (and who isn’t? ), some things are worth the indulgence. Just ask Oprah.